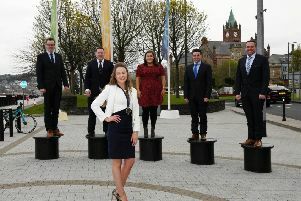 Members of Young Farmers’ Clubs from Co Tyrone will once again put their acting skills to the test for the annual Ken Russell Rosebowl one-act drama competition. Taking place in the 2000 centre, Newtownstewart on Friday, April 26, the event promises to bring laughs by the wheelbarrow load, with a selection of hilarious one-act plays from local YFC clubs and some jokes and yarns’ in between for good measure. In the run up to the hotly anticipated event, members of the four clubs taking part - Derg Valley YFC, Cappagh YFC, Trillick and District YFC and Seskinore YFC - have been busy crafting their productions, with casts made up of members of all ages and concepts old and new. The clubs will be competing for the coveted Ken Russell Rosebowl accolade, which was scooped last year by Cappagh Young Farmers’ Club with their hilarious construction site based one-act play. Other sought after awards, such as the ‘most memorable moment’, and best junior and senior actor and actress will be presented on the night. The event will take place on April 26 at 7.30pm at the 2000 Centre, Newtownstewart. Admission is £5, under-12s are free. For more information, contact John Armstrong on 07805870943 or Margaret Little on 07510618659.